CHARLOTTESVILLE — Steps from the Robert E. Lee statue downtown, two white people on a bench call out to a stranger. It’s been two months since the former Lee Park was renamed Emancipation Park, and 150 years of Confederate history again came up for debate. Two days since the latest reconsideration of Confederate totems had again ended in death. “Who are you with?” the pair demand of a black reporter, and it seems an immediate proxy for more freighted questions of history and allegiance — What side are you on? and Are you with me? Questions hang over the city, the South, the nation, since white nationalists at a Unite the Right rally Saturday clashed with counterprotesters and a Nazi sympathizer allegedly plowed into activists, killing one young woman and injuring 19 others. Two police officers monitoring the protests also died when a mechanical failure sent their helicopter crashing to the ground. Rallies have continued around the country, and demonstrators in Durham, North Carolina, toppled a Confederate soldier’s statue. Here, flowers and candles mark the makeshift memorial where Heather Heyer, 32, was struck, and a crowd of mourners stand close by to pay homage. Others sit, silent and staring. “Forgive us, Rest in Power, Love Always Wins,” read the messages in chalk. But like the questions from the people on the bench, they feel incomplete to the moment — like people reckoning with the immediate aftermath of trauma while everyday instances of racism and privilege exist in plain sight. On the first workday since the tragedy, black men in brown delivery truck uniforms are unloading boxes and white men in summer suits visit the growing dedications to the fallen over lunch hour. Then everyone returns to their separate understandings of the world and how something like this could happen. The questions don’t stay downtown, of course. The University of Virginia football team was at practice when they heard about the violence a few miles away. Team members are grappling with their own conceptions of race and hatred. It’s a moment for them to set an example, they say, and especially for the myriad lessons of football to come into play. They want to play hard because they’re not just representing the school, “we’re representing Charlottesville,” Kiser said. And that extends past the UVA grounds. “Once you go down Main Street a little bit past campus, [the city] becomes a lot more black, and a lot of times a lot of people in Charlottesville might not feel that connection to the University of Virginia,” Kiser said. And they can change that. In the office of second-year head coach Bronco Mendenhall, there’s a book of quotations from the school’s founder and the nation’s third president, Thomas Jefferson, a slaveholder, who in his treatise Notes on the State of Virginia wrote that “blacks […] are inferior to the whites in the endowments of both body and mind.” Mendenhall notes the contradictions of Jefferson’s legacy. In the immediate aftermath of Saturday’s violence, the team focused on safety, routine and making sure players felt like they could talk about how they were feeling — some of the Nazi protesters were staying on the first two floors of their team hotel. Longer term, Mendenhall calls it an opportunity for character building. There may be a trial for the killing and injuries Saturday, and the white nationalists said they’ll return to Charlottesville, so the players will be contending with these crosscurrents for a long time. “Here’s conflict and here’s hate and here are these other issues with free speech ironed in there somewhere, and here are these young people who really would like to do something. They don’t want to sit on their hands; they want to act appropriately, but also they want to make a difference,” Mendenhall said. They want to model unity and tolerance, something he said they’ve worked on as a team. 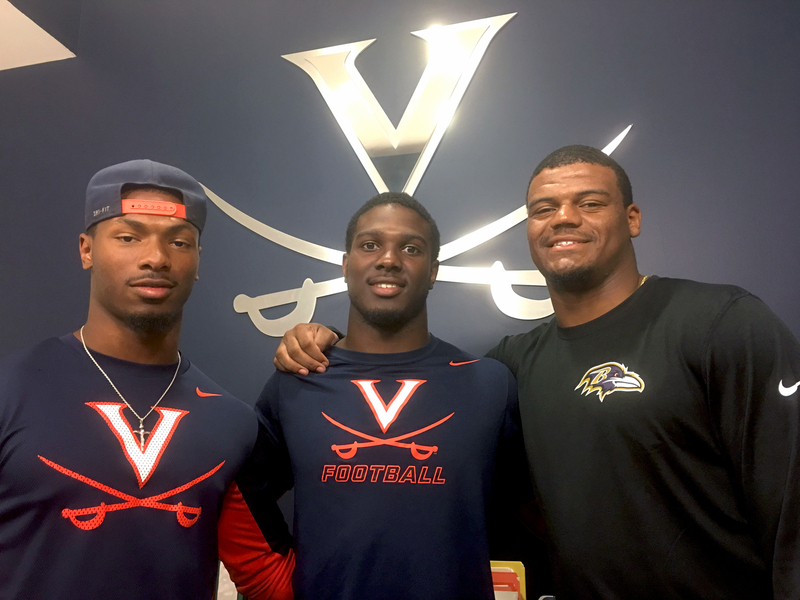 It’s hard to call what happened a blessing, but “the chance for outreach and a teachable moment in a program that’s new, under this backdrop, is almost perfect for the chance to do good,” said Mendenhall. And if they have success on the field, that will make their message all the more powerful.